Back on November 11 of 2015, SFFAudio tweeted about four stories from the famous SF magazine Planet Stories that have fallen into the public domain and are available as PDFs at the SFFAudio website. I read this tweet as I sat in the Toyota Corolla, in a dark parking lot, waiting for the wife, and all four of these stories actually sounded pretty good. So this week I directed the ol' browser to SFFAudio and read these four tales that first appeared in the fall of 1951, those unhappy and happy days when UN forces were defending South Korea from the commies and I Love Lucy first hit the airwaves. "Last Night Out" by "Lee Gregor"
Lee Gregor is a pseudonym used by Milton A. Rothman, a physicist and active SF fan who wrote a number of SF stories as well as books on science. "Last Night Out" is about prejudice and race relations. In the future the human race is in contact with dozens of intelligent alien species, and relations are more or less cordial. But when a war erupts with a new and mysterious alien civilization, relations have to get a whole lot closer in a hurry. The best part about "Last Night Out" is how our Terran hero, Grey, and our furry Canopan hero, 647-B-43C (AKA "Joe"), work together. Joe's people have powerful psychic abilities, but their tentacles are not very good at using tools. Together, Joe and Grey make a perfect technician: when a piece of machinery malfunctions, Joe can look "inside" the machine and immediately see what is wrong, and guide Grey in quickly and efficiently repairing it. Obviously, fixing your space battleship fast can be the difference between life and death in a space war, and human-Canopan teams like Grey and Joe's are a vital component of the war effort. Being in constant telepathic rapport, and holding hands all the time, Grey describes his relationship with Joe as much like that of a husband and wife. Joe's powers even enable Grey to better enjoy music. But most humans find Canopans disgusting and/or scary, making downtime on Earth stressful or even dangerous as Grey and Joe are confronted by racist slurs and angry mobs. Anti-racist stories and stories about the value of cooperation can be sappy or schmaltzy, but Rothman manages to give his story an edge and a layer of ambiguity. At the end of the story we learn that the Canopans can use their psychic powers to instantly kill humans, and perhaps even control them like puppets, and we are left to consider the possibility that the Canopans are stealthily making us their slaves! I don't think I've read anything by Coppel before, but he appears to have been a prolific writer of short stories as well as a successful novelist inside and outside SF, with quite a few dramatic love stories and espionage thrillers to his credit. "Tydore's Gift" has a good atmosphere and good images, but the ending is too gimmicky and silly. The short (less than four pages) story works well until the end. Morley gets his hands on the atomic rifle but when he tries to murder Tydore with it he learns, too late, that Tydore crafted it so the muzzle looks like the stock and vice versa. Morley shoots himself to death. Good in a lot of ways, but a disappointment at the end. Dee only has one novel listed at isfdb, but many short stories, most in the 1950s. This one is even shorter and more gimmicky than the Coppel, and lacks the Coppel's rich atmosphere and settings. A writer/researcher has figured out that the Earth has been infiltrated by aliens in disguise, and that these aliens have been manipulating human history. That is why the Earth has such a history of war and crime, he thinks. But when, gun in hand, he confronts one of the aliens, he learns the unhappy truth: the aliens are here trying to manipulate us into being good. Thousands of races throughout the galaxy have been guided by the agents of the Kha Niish, been turned away from violence and set on the societal course to a "benign culture." Humans, however, are far too violent and have signally rejected the urgings of the Kha Niish agents, and so they are on their way back into space. Incorrigible humankind will no doubt exterminate itself in a short time. After the alien missionaries leave, the researcher uses his gun to commit suicide. "Vengeance on Mars!" by "D. B. Lewis"
"D. B. Lewis" is a pseudonym used by Jerome Bixby. Bixby is the author of the famous story "It's a Good Life," immortalized in The Science Fiction Hall of Fame and as an episode of The Twilight Zone TV series. He also contributed to the Star Trek TV show and the film Fantastic Voyage, which features much-beloved stars Raquel Welch and Donald Pleasance. I thought the Mars in "Tydore's Gift" was based on the Near or Far East; I think the Mars in "Vengeance on Mars" is based on the American West and colonial Africa in the late 19th century. Enterprising Earthmen have come to Mars and set up farms, with the natives (whom they call "redboys") as their field hands. Earthers more interested in a fast buck than the hard work of building up a farm make money by looting Martian temples. This pisses off the redboys, and, because the colonial government won't solve the problem (they are regularly bribed by the looters!) the human ranchers have banded together to exact some frontier justice from one looter. The looter is holed up in a temple, a veritable fortress, and if the farmers don't get him out of there and "take care" of him before morning, the redboys will "go on the warpath," likely killing scores or hundreds of human settlers! The farmers send into the temple to negotiate one of their number who, years ago, was friends with the looter. Will the looter come out peacefully? Or come out blasting? Will he escape or pay for his crimes? Who will live and who will die? This story is an acceptable entertainment; the Martian setting is well done. There's no twist or redemption at the end--the looter tricks his friend, steals his friend's blaster, tries to shoot his way out, and dies in a hail of blaster fire. I guess this story is about how the frontier can bring out the worst in people. These stories, taken as a group, are pretty good. 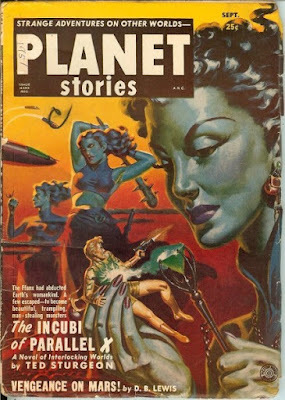 Maybe I'll read more from Planet Stories' September 1951 issue later this week.